Someday, Livvi Gray will break free from her past. Someday, she will escape her recurring nightmare about a stranger in a shimmering silver dress. Someday, she will have a family of her own. Now she's found Andrew, and someday seems to be right around the corner. But there's so much Livvi doesn't know. Shortly before her 30th birthday, she will come face-to-face with the stranger from her dream - an encounter that will alter Livvi's future and crack open everything she knew about her past. Livvi is swiftly moving toward the ultimate turning point in her life - and she's not the only one. Linked by an unforgettable mystery, photographer Micah and young mother AnnaLee are also being rapidly drawn into a web of secrets about the unexpected ways in which we choose to protect - and betray - the people we love. ©2013 Dianne Dixon (P)2013 Brilliance Audio, all rights reserved. 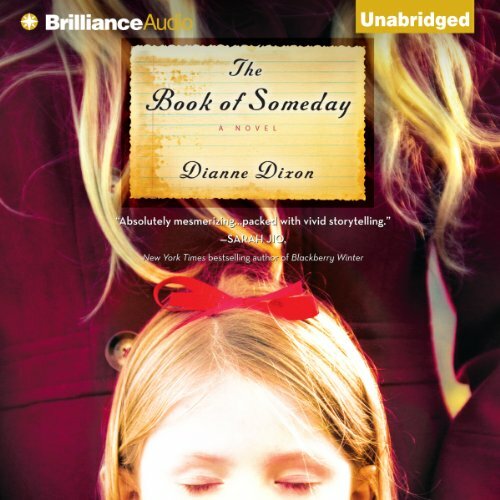 The Book of Someday is a well-written complicated and in depth story of love, forgiveness, love, deception, suspense, mystery, and abuse. The story of three women Micah, Anna Lee, and Olivia (Livva) –all with a past and during the novel you do not know how these three are connected. It is only at the end you find out their connection. The author does an outstanding of job of suspending you in time and building for the finale which is bittersweet. I purchased the audio version and the narrator did an exceptional job; however, at times I had to rewind if busy driving, to go back and capture an important part I may have missed to keep up with the characters. The book is mesmerizing and captivating –centered around Micah’s secrets----as usual, Dianne Dixon does not disappoint her fans! Yes. Well written and captivating, this book will draw you. This book was deeply moving and well performed. Livvi. Her strength of character and innate goodness are refreshing. Her voice lends itself to the story and only makes it more enjoyable.